Mix all ingredients in a mixing bowl, Knead the dough soft by adding sufficient water. Keep it aside for 15-20 min. Then make 9 -10 portions of dough of 1.5 inch in size. Take one portion of dough apply little flour on the polpat or flat surface. Then roll gently to make thin chapati of size 10-12 inch in size. First roast each khakhra till it is becomes little brown in colour. Keep it aside. Then make bunch of 5 khakhra and roast on tava by placing small size pressure cooker (preferably 1-5 to 2 lit) on the top of the bunch. Just roast by moving cooker in circular manner. After every 1 min remove khakhra facing tava, now it should be placed on top facing pressure cooker, each khakhra should be roasted in this way on medium flame, with very fast movement. Otherwise khakhra will get stick to each other. 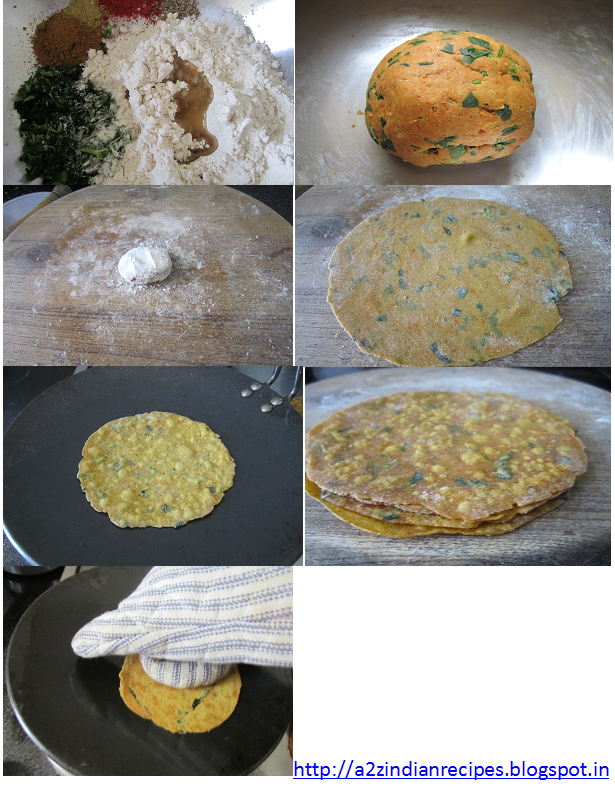 Remember to roast khakhra on both sides, that is why it becomes very thin and crispy. Apply ghee on khakhra and sprinkle jiralu powder and serve. Put on thick gloves one over the other on your hand. Then make two bunch of chapatis and then move and press your hand wearing gloves in circular fashion on both sides of chapatis so that it becomes crispy. In this way you can roast 10 khakhra in 5 min only.